KATHMANDU, May 3: Bijay Gachchhadar-led Nepal Loktantrik Party (NLP) has declined an offer by Prime Minister Pushpa Kamal Dahal to join the government, but said the party will continue its support to the coalition. 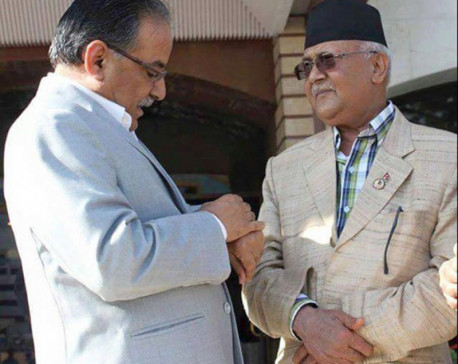 After the Rastriya Prajatantra Party (RPP) withdrew support to the ruling coalition on Monday, Prime Minister Dahal held a meeting with Gachchhadar on Tuesday and urged him to join the government promising him a deputy prime ministership and the home ministry portfolio. Chairman Gachchhadar in the afternoon briefed the party's parliamentary party meeting about his meeting with Dahal. “We shouldn't withdraw support to the government in this critical time because the decision would be irresponsible as it is almost likely to trigger political chaos in the country,” Chaudhary quoted Gachchhadar as saying at the parliamentary party meeting. At the parliamentary party meeting, NLP leaders and lawmakers expressing dissatisfaction over the government's activities had demanded that the party withdraw support to the Dahal-led government. But according to Chaudhary, party leaders changed their mind after Gachchhadar told the meeting that Prime Minister Dahal requested him to continue support to the government saying that such a decision would undermine the ambience for constitution amendment. According to party sources, NLP leaders suggested to the party leadership not to join the government until the May 14 local polls. Citing the agreement between two major ruling coalition Nepali Congress (NC) and CPN (Maoist Center) to hand over government leadership immediately after May 14, the leaders suggested the party leadership to wait until that date. “If we should join the government it will be wise to join the next government after the polls,” a leader said requesting anonymity. The party has finalized three conditions for joining the government in future. The party has sought clear roadmap for constitution amendment, release of party cadres arrested in connection with the 2015 Kailali incident and convincing answers from the governing parties on the impeachment motion brought against Chief Justice Sushila Karki. NLP has 17 seats in parliament and the Dahal-led government will fall in minority if the party withdraws support.